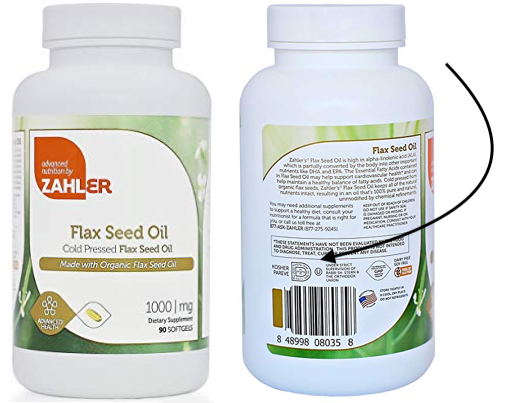 Is flaxseed oil pills Chametz? Are flax seeds kosher for Passover? Yes, they are kosher for Passover if they raw, and certainly not Chametz. The Star-k contains neither flax seeds nor linseed oil. The cRc Guide states explicitly that “Flax seeds are not kitniyot“. The OU lists linseed in the category “The following are not considered Kitniyot, but may require special checking”. Kashrut.com writes as a comment on flax seeds “this is considered to be acceptable by some rabbis and kitniot by others”. Note: The image product IS NOT kosher for passover. Next PostNext I am allergic to wool. Can I wear Tzitzit?